Let me take you to the mountains, where a ghost lives...a beast, who clings to the steepest reaches of the mountain kingdoms....a beast the color of winter, as it has been called. You may have seen one, high on a cliff side, peering down on you with a gaze of sheer confidence, and almost of pity, that you, a creature of the flats, is not capable of the high-cliff aerobatics and skill to scale to the same heights that it sits so comfortably upon. It's black eyes set out by its pure white coat. Daggers protrude from upon its head...rapiers that are not made for the lower class behavior of battling another for a mate...but more for letting another know that getting completely shredded is a real possibility. Or you may have met a more gentler beast of the same species...groups of them, working the edges of high alpine back-country campsites, where the possibility of obtaining morsels of backpacker meals, or licking the urination spots of those same backpackers (yep, that's right! ), keeps them quite happy. They are a beast that is greatly admired by man for not only its mountaineering ability, but also by its appearance. When you think of the times that you have seen them upon their lofty heights, what do you think about? What feelings are evoked by these creatures? Or if you have not seen one, what do they mean to you? I would love to hear about it, and any stories or experiences you have had with them. Here's my experience: I just looked for "goat" in Google images because I need to see how to embroider a goat face for a baby quilt...AND, the first 4 out of 5 images that came up were labeled "Jesse DeVoe"! 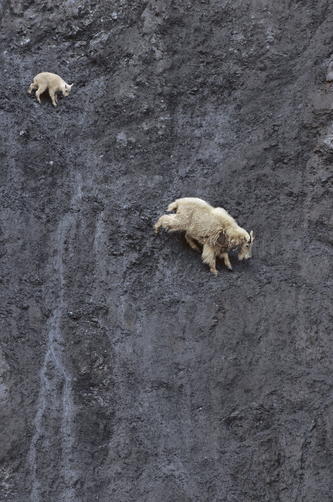 We've also been amazed and thrilled by mountain goats--the ones we've seen in Palisades (just dots of white fluff on the cliffs), and the adults and kids we could have reached out and touched on a high trail at Glacier NP, many years ago. Thank you for working to preserve the wild mountain goat. A neighbor, informs me that he has won a goat permit in the Lost River/Lemhi ranges. He is a very determined hunter, strong, and one that spends time learning about his quarry and its behavior. He will search for the big billy and I suspect he'll be successful. I'll relate his story to you.